I ran into CB2 the other day and was stopped short by these cute little porcelain knives they carry. As I stood there, a poem my grandmother used to write me at Valentine’s Day popped into my head. 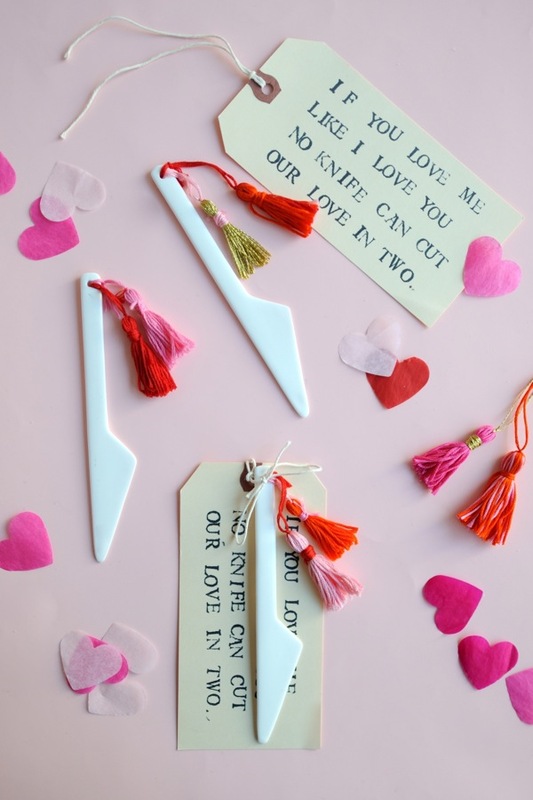 Knife + poem = a sweet little valentine for less than the price of a card! 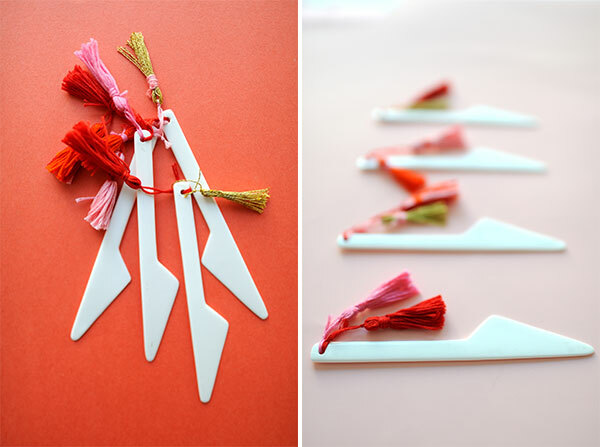 Colorful mini tassels add a bit of color. Tie it all up, put it in a rigid mailer, and mail it to your valentines near and far, or hand out as favors at a Valentine’s party. 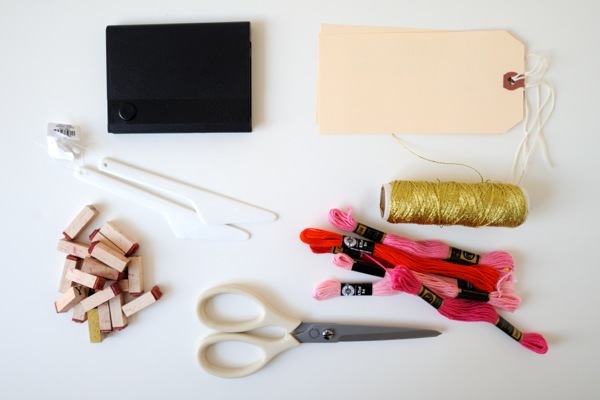 Step 1: Holding two fingers a few centimeters apart, wind the embroidery floss around and around, about 20 times. Step 2: Gently take the floss and lay in on the table. Insert a 8” piece of floss through the circle, and tie a tight knot. Step 3: Smooth the floss together, and begin wrapping more floss 1/2” down from the knot you just tied. Wrap about 15-20 times, then tie tightly and snip the ends. Step 4: Using sharp scissors, snip the bottom of the loop. Trim the edge straight if necessary. 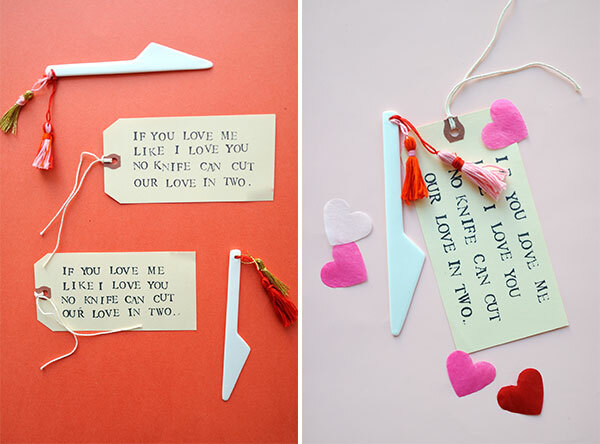 Step 5: Stamp the following poem on the tag: If you love me like I love you, no knife can cut our love in two. Stamping will go a lot faster if you do a few at the same time. 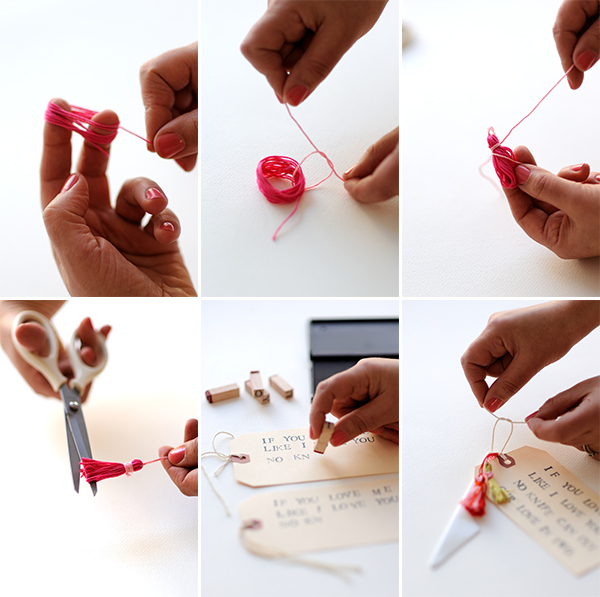 Step 6: Attach tassels and poem to the knife. Wrap it in tissue, put it in a rigid mailer or a small box and send off. Up to you if you want to be a secret admirer or let them know who it’s from! 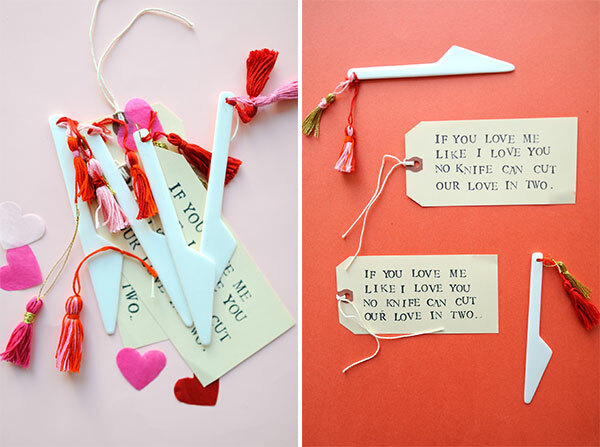 The phrase on that tag is so catchy! Cute! 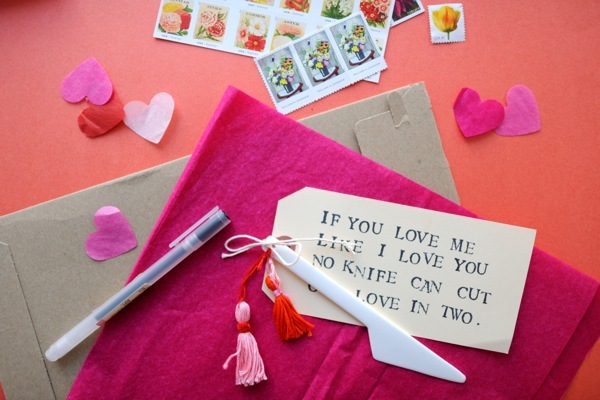 Is it just me or does sending a Valentine with a knife attached send the wrong message? Unless this is hipster ironic, in which case it’s still kinda creepy. love the tassels and the type set, though. These are beautiful! But it is supposed to be bad luck to ever gift a knife (superstition says gifting a knife severs the friendship). So in England and Sweden, the tradition is for the receiver to give the giver a penny or silver coin in exchange– making it a transaction rather than a gift, and thus restoring good karma. I think it’s fascinating! And I also would advise against the whole “sending a knife in a rigid mailer as a secret admirer” thing. That just seems like a miscommunication waiting to happen! Hi E – Yes, I suppose you’re right! Now that I think about it….knife……anonymous stamped message…it IS kind of stalker-ish! Hopefully your friends have a sense of humor! I don’t know, I just have always loved that little Valentine’s poem and that’s what inspired me. Sarah – I’ve heard of that tradition and think it’s fascinating too! Thanks for your comments! It is a little creepy but super duper creative. So happy to see something other than cupcakes and candy.